If you want to make a big impression with your landscape make your hedges into sculptures. Sometimes referred to as topiary, hedge sculpting is the art of cutting hedges and trees into shapes. Hedge sculptures can add plenty of wow factor. They also, however, create plenty of work. If you want to create hedge sculptures in your landscape, be prepared to cut the hedges by hand to get the best form and shape to your hedges. Cut hedge sculptures during the time of year that is best for pruning the hedge in general. The best time for a hedge that blooms before June is late summer and the best time for a hedge that blooms after June is during winter, according to Michael Dana and Philip Carpenter of Purdue University. Select a design for each hedge that you want to turn into a sculpture that matches the natural shape of the sculpture. A tree that already has a conical shape, like a small pine, for instance, can be more easily shaped into a cone or spiral, while a round shrub lends itself to ball shapes. Trim any branches on the hedge that jut out from the main form of the tree before you get started. Cut the branches back so that they are roughly the same height of the other branches on the hedge. Begin forming the hedge into the sculpture that you want to create, starting at the top. If the hedge is taller than you, use a step stool to get above the hedge so that you can form the top first. 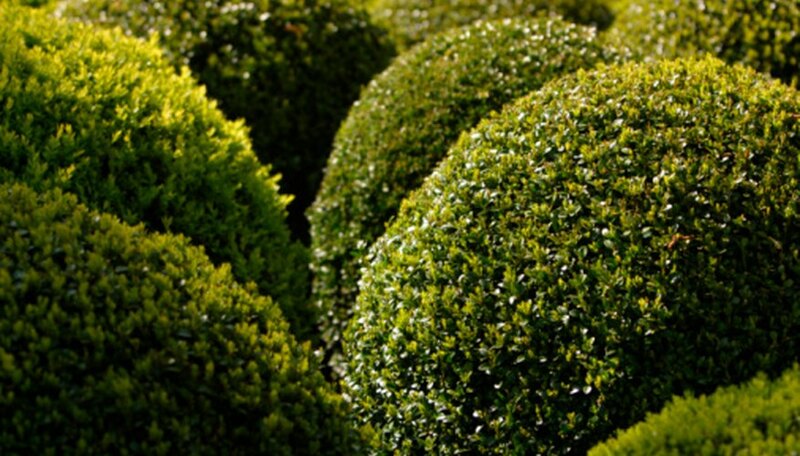 Cut by sight to create basic topiary hedge sculptures, such as cones and balls. Begin a cone by cutting the top of the hedge into a triangular shape, with the very top of the hedge going into a point just above the main branch. Begin a ball-shaped sculpture by cutting the top branches of the shrub into downward arcs to round the top of the shrub. Continue cutting downward to finish the hedge sculpture. After every few inches of branches that you cut around the hedge, step away from the shrub and look at it from a distance of 5 to 6 feet to make sure the shrub is taking the shape that you want and then return to cutting. Get a topiary form for the hedge if you want to create a sculpture that you cannot cut on your own. Topiary forms slide over a hedge and then you simply trim branches back to level with the form to create your sculpture.